Trump Wants Pentagon To Stage Military Parade Down Pennsylvania Avenue : The Two-Way The president has directed the Pentagon to look into a parade, possibly to take place on Veterans Day. He was apparently inspired by the Bastille Day parade he saw last summer during a trip to Paris. 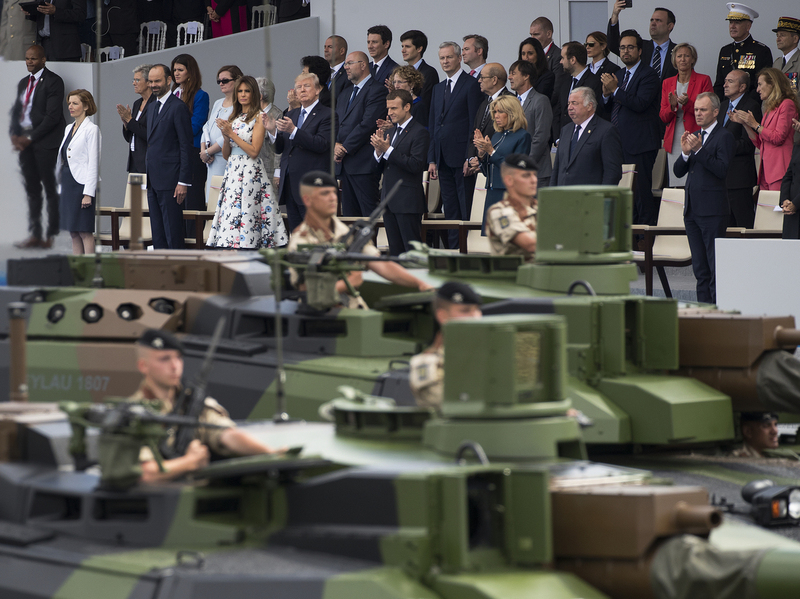 Tanks parade past President Trump, first lady Melania Trump, French President Emmanuel Macron and his wife, Brigitte Macron, during a Bastille Day parade on the Champs Elysees avenue in Paris on July 14, 2017. President Trump, apparently inspired by the Bastille Day parade he witnessed last summer during a trip to Paris, has asked the Pentagon to look into staging something similar — but naturally bigger and better — for Washington, D.C., the White House confirmed Tuesday. A U.S. official confirmed the request to NPR. On Tuesday evening, White House press secretary Sarah Huckabee Sanders shared in a statement that "President Trump is incredibly supportive of America's great service members who risk their lives every day to keep our country safe." She added, "He has asked the Department of Defense to explore a celebration at which all Americans can show their appreciation." "I think we are all aware in this country of the president's affection and respect for the military. We've been putting together some options. We'll send them to the White House for a decision." U.S. presidents have long shied away from such displays of military prowess — which typically include tanks, missiles and, in some cases, goose-stepping soldiers — for fear of being compared to Washington's Cold War adversaries, where such displays have traditionally been potent symbols of state power. Those countries include Russia (and, formerly, the Soviet Union), China and North Korea. Gulf War veterans on parade in Washington, D.C., in June 1991. "To have a military parade without the end of a war or an inaugural or some big reason in Washington, D.C., that is out of our tradition," presidential historian Michael Beschloss told NPR. Beschloss points to the 1950s, when Dwight D. Eisenhower was president and Soviet leader Nikita Khrushchev presided over large military parades showing off the latest in Soviet military might. Beschloss says some in the White House approached Eisenhower, himself a decorated military general, suggesting the U.S. do the same, to show off American might. "Eisenhower said absolutely not, we are the pre-eminent power on Earth," Beschloss says, recalling Eisenhower's response. "For us to try to imitate what the Soviets are doing in Red Square would make us look weak." While the U.S. puts on various annual July 4 and Veterans Day parades, as The Associated Press notes, those typically do not include such "gaudy displays of military hardware." The president's wish, first expressed months ago, seems to have gone from a "seemingly abstract desire" to something closer to a presidential directive at a meeting between Trump and top generals last month, according to The Washington Post. At the Jan. 18 meeting at the Pentagon that included Mattis and the chairman of the Joint Chiefs of Staff, Gen. Joseph F. Dunford Jr., "The marching orders were: I want a parade like the one in France," a military official who spoke on condition of anonymity was quoted by the Post as saying. "This is being worked at the highest levels of the military." 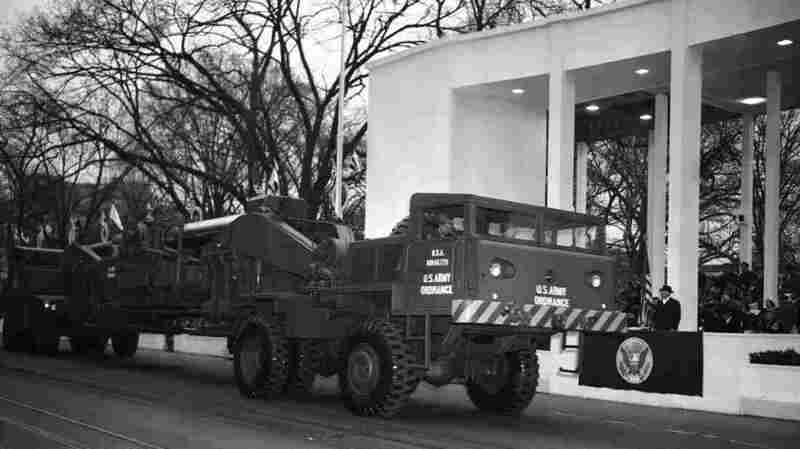 The Army's atomic cannon is hauled past the presidential reviewing stand during the inaugural parade for President Dwight Eisenhower (at right), Jan. 20, 1953. Back in September, at the start of a bilateral meeting with French President Emmanuel Macron, Trump praised the Bastille Day parade and said he was hoping "to do something like that on July 4 in Washington, down Pennsylvania Avenue." Trump added, "We're going to have to try and top it," explaining that one of his earliest calls upon returning from France last July was to get the wheels turning on an American version, "having a really great parade to show our military strength." "I'm speaking with Gen. Kelly and with all of the people involved, and we'll see if we can do it this year," Trump said. Although Trump talked about July 4, a date for such a parade has reportedly not been determined and the Pentagon prefers Veterans Day in November, according to the Post. The location also has yet to be decided, but the newspaper says the president wants it to proceed along Pennsylvania Avenue, a route that would send it past the White House, the Capitol and the Trump International Hotel. 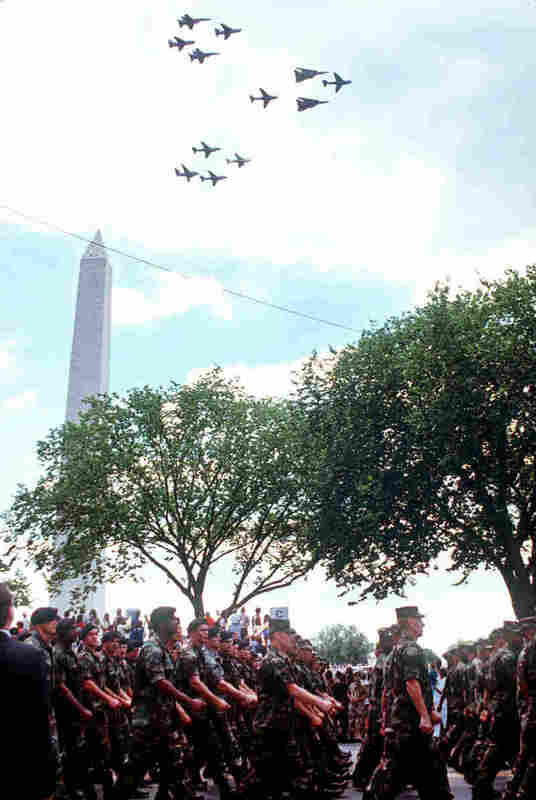 The last U.S. military parade, in 1991, celebrated victory in the Gulf War. Some 8,800 veterans of Desert Storm, led by Gen. Norman Schwarzkopf, marched down Constitution Avenue in Washington. Street lights were removed along the parade route to make it easier for tanks to maneuver. At least 200,000 people gathered to watch. Both of Eisenhower's inaugural parades and the parade for John F. Kennedy included missiles and other military hardware, a practice that has fallen out of fashion. Trump's request has already drawn criticism — especially on Twitter — from people voicing concerns about how much the parade will cost, the message the parade will send and what it says about the president's priorities. Others support Trump's request, saying that a military parade is a great way to honor service men and women.